Christine Gwinn is a committed litigator, researcher and advocate. Christine is a zealous advocate, always ready to dig into the details and develop creative solutions for her clients. Her practice focuses on business disputes, medical malpractice, product liability, and white-collar criminal defense and corporate investigations. She developed strong research and writing skills working on a variety of civil and criminal matters as an intern for both the U.S. Attorney’s Office for the Middle District of Alabama and the Child Exploitation and Obscenity Section of the U.S. Department of Justice. Christine attended law school at Georgetown University Law Center, where she served as senior articles editor of the Georgetown Journal of Legal Ethics and mentored first-year students in legal research and writing. Christine was also recognized as a Special Pro Bono Pledge Honoree for completing more than 140 hours of local community service and pro bono work. 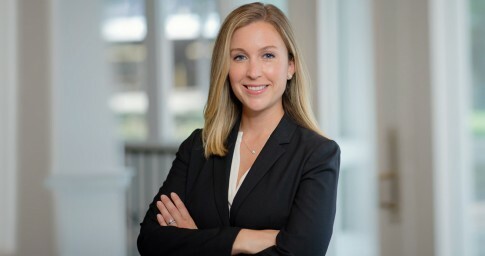 In her final year of law school, Christine was a visiting student at the University of Alabama School of Law, receiving the highest overall grade in both Trial Advocacy and Human Trafficking. A native of Dothan, Alabama, Christine attended Furman University, triple-majoring in anthropology, Asian studies and religion. As an undergraduate, she was inducted into Phi Beta Kappa and received the Baggott Excellence Award, the David Anthony Smith Award and the Robert L. Cate Research Fellowship. Outside of the office, Christine enjoys traveling, hiking and spending time with her family and friends.